Za’atar is a magical Middle-Eastern spice blend that can be mixed with olive oil and used as a dip or rubbed on bread. Peel the pumpkin, remove the seeds and cut into wedges. Place on a tray, drizzle with the olive oil and season. Roast in the oven for about 30 minutes until golden and soft. Add the garlic half way through the cooking time. Put the pumpkin and the garlic in a food processor together with the lemon juice, the cumin and the tahini and blend into a smooth paste. Heat the olive oil and cook the onions over medium heat until soft. Add balsamic vinegar and sugar and season to taste. Heat the flat breads in a preheated oven and spread with the hummus. 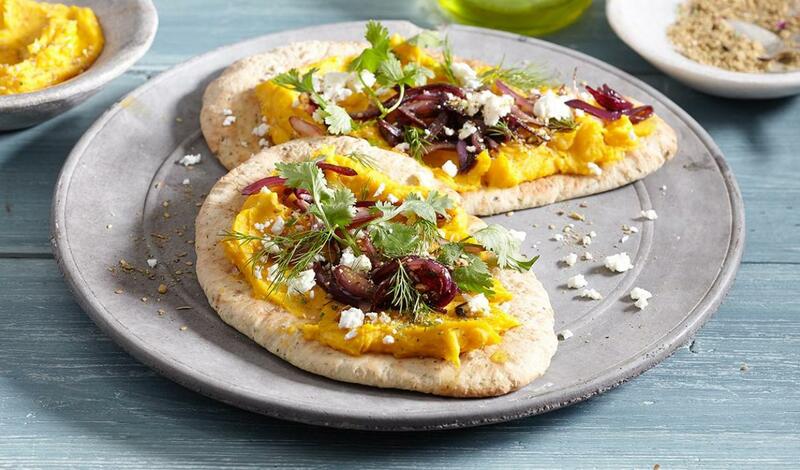 Generously sprinkle each flatbread with za’atar and prepared onion confit. Crumble the feta over the flatbreads, garnish with fresh cilantro and dill.